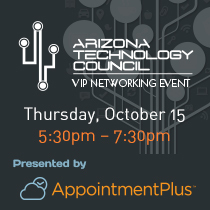 In its continuing effort to support the local tech and start-up communities, and in honor of its long-standing relationship with AZTC, AppointmentPlus is thrilled to host the Thursday, October 15 VIP Networking Event. ¡Oye! ¿Como va? : a special networking game sure to turn even the shyest event-goers into professional self-promoters. Plus, Mariachis, Mr. Microphone, and plenty of stuffed monkeys. AppointmentPlus scheduling software is a configurable, rules-based, pure SaaS product. Our software ― combined with our deep product integration knowledge, customer experience focus, and amazing ability to analyze synergies and synergize analogies ― has made us the vendor of choice for many Fortune 500 companies. Since 2001, AppointmentPlus has been working with businesses to automate their complex customer, staff, and resource scheduling rules. Last year, our Scheduling Cloud™ API helped 215,430 locations worldwide schedule more than 54 million appointments. Want some more awesome-sauce? Visit AppointmentPlus.com.